The fact that the very first houses for humans were built underground was not a random decision. Caves, thanks to their useful covering and perimetral walls features, which are buried in rock and earth, present habitable conditions that are a lot more comfortable than outdoor buildings. The buried and semi-buried constructions count on a highly-efficient enveloping, mainly thanks to the mass of earth and rock that insulates the house. In terms of energy, the semi-buried spaces have the advantage of being isothermal: they maintain a stable thermal temperature of 15º the whole year round. In winter, the rocky walls stop the heat escaping, and in summer, the heat from the sun is not able to find a way inside the cave, all of which contributes to a comfortable temperature being maintained. Thanks to this thermal conservation, underground constructions are more sustainable with 90% lower energy use than in common spaces, where it is close to 0. A feature which provides them with the maximum energy certification of buildings, the letter A, which stands for a highly reduced amount of CO2 in the atmosphere. Energy savings and pollution emissions in the atmosphere make caves one of the most sustainable and habitable options, as well as ecological and economical. These characteristics are increasingly considered in a world where pollution has a strong impact on people’s health. “other types of buildings are emerging, those which really heal the scars of their own construction”. “Smooth architecture which leaves the land in no worse state than in which it was found”. The photocatalytic cave in Mexico has been built under ground, what makes it possible to make the most of the sustainable characteristics of a semi-buried space. These advantages had to go in line with the materials used in the interior design of the cave, according to Amezcua Arquitectos and the MM real estate company. For this purpose, sustainable materials which strengthened the ecological character of the project were sought after. The KrionTM solid surface with the K-Life technology was the choice as the material to shape the epicentre of the cave. The KrionTM K·Life with the KEAST technology has the air purifying feature, which makes it ideal for an underground atmosphere. As well as that, it provides the cave with excellent health conditions for people. In addition to that, the full-body feature of the mineral compact from KrionTM comes with a zero-porosity surface which is bacteria-free and jointless, therefore enhancing hygiene, maintenance and cleaning conditions. 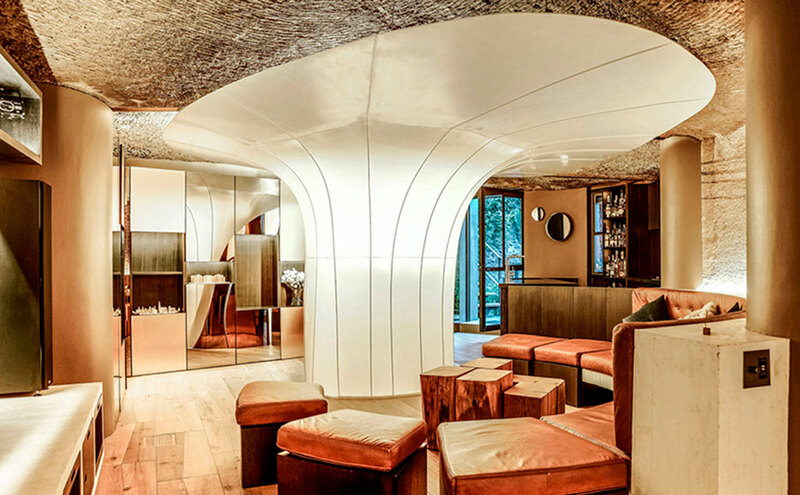 The thermoforming (in curved sections) ability of KrionTM K·Life is carried out in a centre which is tree-shaped in the 1100 dark white colour, which contrasts with the raw aesthetics of the rest of the cave, strengthening natural materials and the unspoilt stone. A sustainable, functional and aesthetic solution for an unusual atmosphere which seeks balance between nature and humans, as well as a better quality of life.